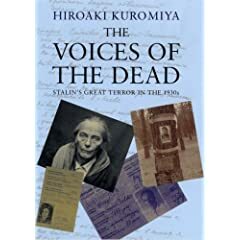 Hiroaki Kuromiya is the author of The Voices of the Dead: Stalin's Great Terror in the 1930s (Yale University Press, Dec. 2007). Stalin once said: "Death solves all problems. No man, no problem." The statement may be apocryphal, but a belief of this kind clearly guided his belief and action throughout his life. Stalin was critical of the sixteenth-century Muscovite tyrant Ivan The Terrible who, according to Stalin, was not resolute enough: Ivan "executed someone and then he felt sorry and prayed for a long time. God hindered him in this matter. Tsar Ivan should have been even more resolute." God did not hinder the atheist Stalin. Once reviewing a list of people to be executed, Stalin said to himself: "Who's going to remember all this riff-raff in ten or twenty years time? No one. Who remembers the names now of the boyars Ivan the Terrible got rid of? No one.... The people had to know he was getting rid of all his enemies. In the end, they all got what they deserved." Stalin was certain that he condemned the "riff-raff" to oblivion by executing them. Yet, ironically, the "riff-raff" left their voices in their police case files which were composed precisely to justify their executions. In my recent book, The Voices of the Dead: Stalin's Great Terror in the 1930s, I seek to demonstrate that the executed can be heard from by reading with care the case files buried deep in the former Soviet archives. We know that the vast bulk of people (in fact nearly everyone) executed under Stalin (at least at the time of the Great Terror of 1937-38) were innocent of the crimes of which they were accused (foreign espionage, terrorism, anti-Soviet propaganda and agitation and the like). No material evidence was presented and no legal procedure was followed (they were executed extra-judicially). Nearly one million people were believed to have been executed in 1937-38. Stalin kept the records of the executed. Many confessed to their crimes and were executed, whereas a relatively few adamantly denied the charges. All the same they, too, were executed. Stalin's secret police had every reason to show that the country was full of enemies of the Soviet Union. The police were happy to beat self-incriminating confessions out of the arrested. A lover of history, Stalin was eager to lead future historians astray by demonstrating, through such confessions, how pervasive his political "enemies" were and that they had to be destroyed. In The Darkness at Noon (1940), Arthur Koestler offered an explanation of the mechanism of self-confession in the person of Rubashov (modelled after Nikolai Bukharin, one of Stalin's archenemies who was condemned in a show trial and executed in 1938). Koestler imagined that Bukharin followed the Stalinist logic of sacrificing fellow communists to the larger cause of the revolution and the survival of the revolutionary regime in the face of Nazism. None of this can be seen in the case files of the executed I have examined. These were all "ordinary" Soviet citizens (workers, peasants, teachers, housewives, priests, beggars, ballerinas, musicians and the like). Their main concern was survival and not revolution. Reading their case files is difficult and tricky. Many did in the end confess to the alleged crimes, some were so scared by the arrest and the threat of retribution that they signed, without resistance, the interrogation documents prepared by the police. Still many did resist and refused to confess. Even then most were tortured into confessions. Perusing the case files, I realized the best way to make sense of the "confessions" was to compare the raw interrogation records (written longhand) with the typescript documents used to inform the higher-ups and indict the arrested. In many cases, the records of initial denials were often withdrawn by the police from the case files, but in some cases they were not. This may have been due to police oversight, but the police at the time probably did not imagine that historians would read the files decades later. By focusing on raw, handwritten documents, I came to understand well the mechanism of interrogation -- the extraction of confessions through threat and torture and the outright falsification of evidence in the Stalinist torture chambers. Reading these handwritten documents was difficult and time-consuming, but I was hooked on it and worked laboriously, because I began to hear in them the agonized voices of the executed. They were not the survivors. They were the executed. It was an extraordinarily rewarding experience, even if it was simultaneously ghastly, painful, and sobering. I felt compelled to let the dead speak -- those "ordinary" Soviet citizens who had been condemned, as Stalin expected, to complete oblivion. A few examples may be revealing. Vera Goroshko was a 23-year-old ballerina in Kyiv, Ukraine. She was accused of being a Polish spy and was executed in 1937. The typed bill of indictment claimed that she confessed to her crime. Yet the handwritten interrogation records show that she denied the charges consistently. All the same she was executed. A perusal of her file shows that she fell in love with a Polish diplomat (Wiktor Zaleski) who was indeed a Polish intelligence officer stationed in Kyiv. It seems to have been a true love affair for Goroshko. For Zaleski, too, this may have been the case. Yet Zaleski also appears to have used her for espionage without Goroshko's knowledge, and, in turn, the Soviet secret police used Goroshko's affair to force her to inform on the Poles in Kyiv. Even so, the police did not trust her (because she was in love with a Pole) and in the end destroyed her. There is nothing to support the allegation that she was a Polish spy. Yet the Soviet police feared that Goroshko might be. She proclaimed her innocence to the very end. The police claimed that she confessed, but no confession is recorded or documented in her case file. In another case, Iadviga Moshinskaia was a 26-year-old newspaper editor in Kyiv. Because she hailed from the family of a Catholic (Uniate) priest, she was by default politically suspect in the view of the Communist regime. Taking advantage of her background which left her vulnerable, the police recruited her as an informer (probably she could not refuse). Yet the police could not trust her because she was politically suspect to begin with. In the end, she was arrested and charged with being a member of a counter-revolutionary Polish organization. As an informant for the police, she found the charges ridiculous and denied them. Unable to force a confession, the police then turned her police work on her: they accused her of misinforming the police and protecting the "true enemies" of the Soviet government from the police. Whether torture was used is not known, but Moshinskaia was broken in the end, confessed to her "crime," and was executed. Perusing these and many other similar cases, one clearly hears the voices of fear, agony, anger, resistance, despair and resignation from people faced with execution. Even their forced silence often sounds eloquent. These people were condemned to oblivion by Stalin for whom their lives meant nothing. Ironically, Stalin's attempt to extinguish their voices was the instrument that has preserved them, in the depths of their case files. At least hundreds of thousands of similar files are still waiting to be read in the archives throughout the former Soviet Union. I would like to hear more from this author or from others on this subject.